Ra: "I am pleased we had the opportunity to help some of the senior population learn how to avoid fraud or getting scammed." 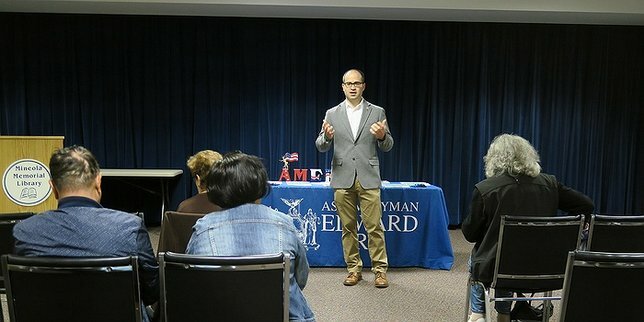 Assemblyman Ed Ra hosted a Healthcare Fraud Prevention Seminar on Saturday, April 28 to help seniors learn how to avoid scams and fraud. Mineola, NY - May 15, 2018 - Assemblyman Ed Ra (R-Franklin Square) was pleased to host a Healthcare Fraud Seminar on Saturday, April 28 at the Mineola Memorial Library. The event featured special guest speaker John Rotondi, a certified senior Medicare patrol educator. During the seminar a variety of topics were discussed including, Medicare cards rollout, scams and frauds related to Medicare cards, how to spot potential fraud and how to protect oneself from these scams and frauds. Subject: LongIsland.com - Your Name sent you Article details of "Assemblyman Ra Helps Seniors Avoid Healthcare Fraud and Scams"